Quick-Step Flooring have been the market leader in laminate floor coverings for many years, however as with many successful companies expansion is key. The recent introduction of Engineered and Solid Wood ranges along with Luxury Vinyl Flooring have made Quick-step one of the largest flooring manufacturers in the world. At our Newbridge Lane showroom we have all the Quickstep products on display and offer friendly and professional advice on choosing your floor. Laminate Flooring has been a mainstay in properties up and down the country for decades. This multi-layered floor covering is manufactured with the patented Uniclic locking system around a HDF (High Density |Fibre) board that's extremely durable and moisture resistant. 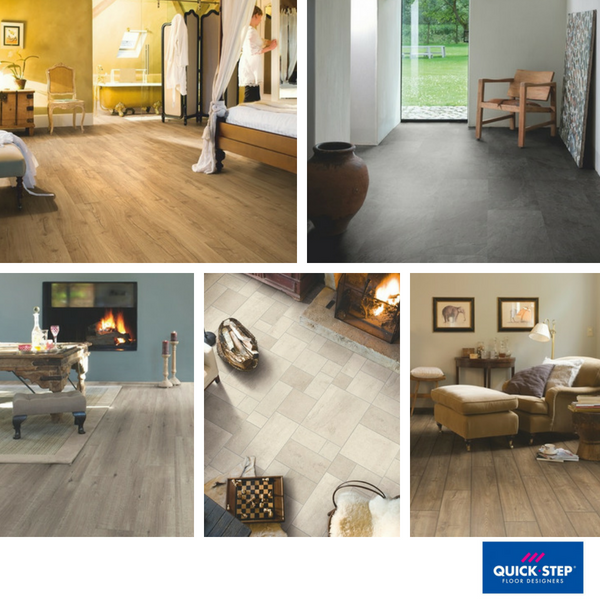 Due to this many Quickstep laminate are back with a 25 year residential guarantee and with the recent addition of Quickstep Hydroseal technology that ensures no water can penetrate the surface on ranges like Quick-step Impressive, Majestic and Eligna. The latest addition to the portfolio is the Quick-Step Livyn Luxury Vinyl Flooring ranges. These are a variety of beautiful wood plank and stone tile designs available in both Dryback and the Uniclic Click locking system which are suitable for residential and commercial installations. We offer all the complete Quick-step Ambient, Balance and Pulse collections at competitive prices along with our take-away sample service so you can see the tiles in the room it will be installed into.